I love cooking with cabbage! There are so many benefits to adding cabbage to you diet. It’s brain food – cabbage is full of vitamin K which helps with memory and overall brain health. As a mom, I sometimes feel as though I’m loosing my mind and memory, so I need all the help I can get! It’s also high in potassium which helps to open up open up blood vessels, increasing blood flow. Its also delicious, so I’d call it a winning veggie. I also love PF Changs. From the combination fried rice, to the Mongolian beef, it’s one of my favorite cheat meals. My absolute favorite is the Lettuce Wrap appetizer. The problem with eating PF Changs is the astronomical sodium content in the dishes. 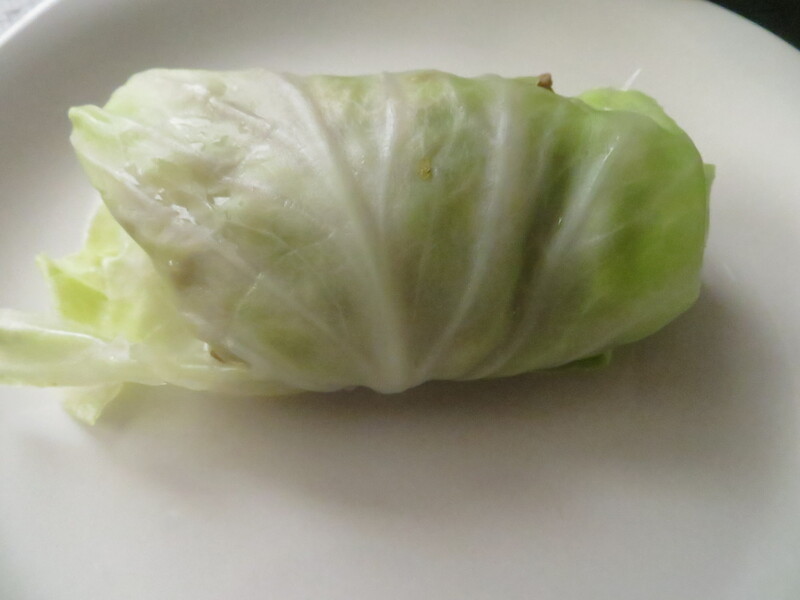 The sodium content in one lettuce wrap appetizer is 2090(mg) – eek! 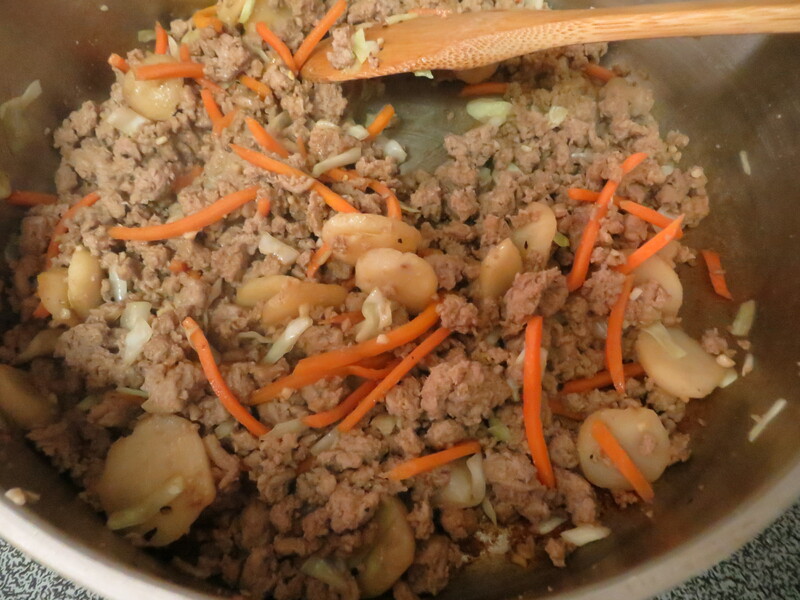 So I set out to create a dish that paid homage to the lovely lettuce wrap without all the sodium! 1. Put a large pot of salted water to boil. 2. 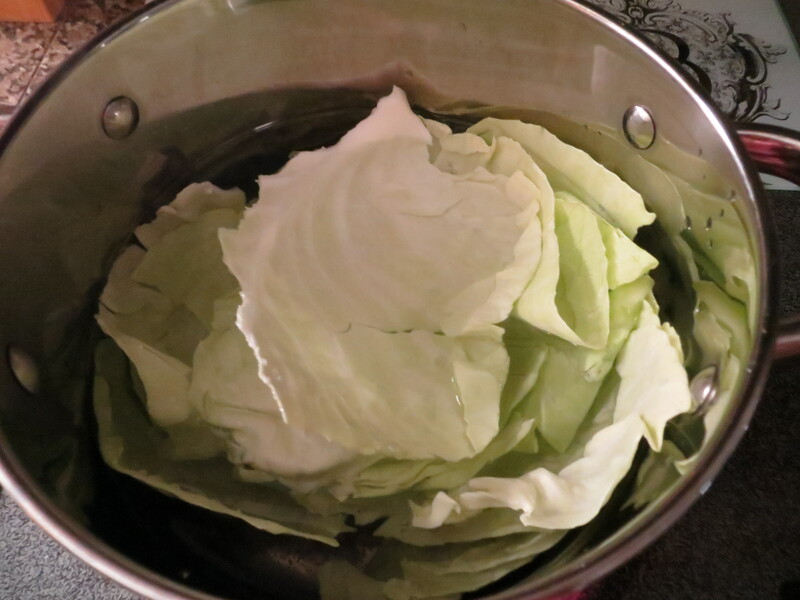 While waiting for the water to boil, remove and wash 12 cabbage leaves from a head of cabbage. I also cut off the stems (the “meaty” part of the leaf). Place the leaves in water, and boil for 4 minutes. 3. Remove the leaves from the water, and place on paper towels to allow them to dry. *For all the perfectionists in the world, the leaves may tear or break – it’s okay! 4. While the leaves are drying, in a separate skillet, brown the turkey. Drain any excess grease after the meat is cooked. 5. Combine the cooked turkey, soy sauce, chicken broth and black pepper in a bowl and allow to marinate for at least 10 minutes. 6. In the same skillet you cooked the turkey, heat the olive oil. Add onions and cook until they become transparent (about 5 minutes on medium heat). 7. Add garlic and ground ginger to onions, cook for 1 minute (until it becomes aromatic). 8. Stir in water chestnuts, carrots and cabbage. Allow to cook down for 2 minutes on medium heat (you will have to stir a lot – it’s okay you’ll get a great arm workout!). 9. Now’s the time to combine the meat. Cook all ingredients together for 10 minutes. 10. By this time, your cabbage leaves should be dry. Time to roll tide roll, ehhh, just kidding! 11. Place your cabbage leaf face down. Add 2 tbsp of the meat mixture to the cabbage leaf, fold up the sides, roll up the middle and place seam side down on a platter to serve. Depending on how big your leaves are, you may have to give or take the amount of “stuffing” you add to the cabbage leaf. Ta-da! You’re done. How easy was that??!! This is a great weeknight meal. It takes minimal effort, its quite delicious and its really healthy. We usually eat this meal with a side of quinoa and wild rice. It’s also great with salad. By cooking at home, you’ve cut your sodium content in half. I say that’s an incentive to put down the take out menu, and pull out the pots!